If your logic board has failed you, let us do the tricky process of installing a new one. 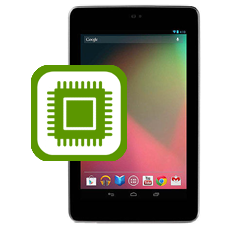 A complete replacement logic board for the 32GB Google Nexus 7 WiFi Model ME370T will be installed. Please note this is not compatible with the 3G Nexus 7 models. This Nexus 7 logic board is suitable for the WiFi only model ME370T. The device will be wiped of all data.